Facebook is moving a step ahead from others and making its social media service as an information sharing platform in serious situations as well. The social networking giant has announced a new tool, which lets users notify their family and friends that they are safe during or after natural disasters. The tool, named "Safety Check," will soon be available globally to over 1.32 billion Facebook users on Android, iOS, feature phones and the desktops. The tool is designed to be activated after a natural disaster and by using either the city you lived in or your last location - if you have checked in on “Nearby Friends”, it let’s you alert your friends and family that you are safe, while also tracking the status of others. According to Facebook, this new move is in sake of 2011 earthquake and tsunami disaster took place in Japan when a deadly tsunami set off 30-foot tidal waves that crashed into the shores of Japan, flooding entire cities and damaging nuclear power plants, where Facebook emerged out to be an effective tool in connecting loved ones and notifying family members of their safety. 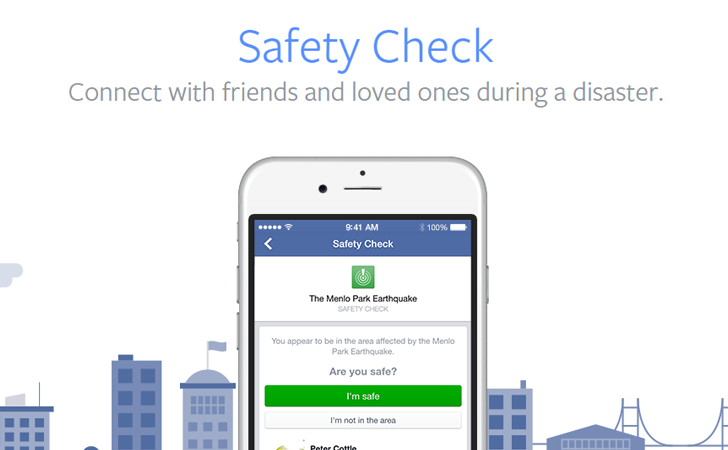 In disaster situation, this tool offers you a simple but an effective way to notify your family and friends about your situation by just clicking on a simple I'm safe / I'm not option, which will push a notification and news feed story that is visible only to people on your friends list. If you have activated the tool, you will also receive a notification about friends who have marked themselves as safe too. You can also have a look on the demo video of Safety Check, which explains how the tool works.